In February i started OS Voxel Section Editor (Name was never set in stone). I only worked on it in February and March and then lost motivation (As well as other stuff i had to do). 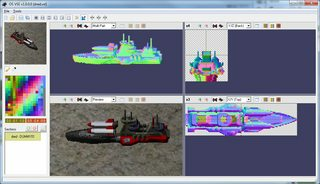 The concept was to first make an app which had VXLSE III's features and then to expand and add features which would let you edit VXL's using the 3d views (Like placing/removing blocks). 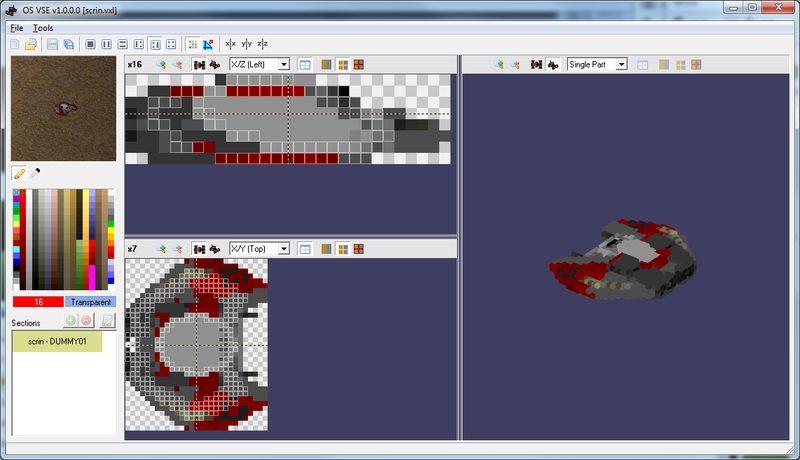 I only got as far as making it so you can view VXL's and some basic editing(It can also save). It does have 4 independent views which remember their settings as well as the ability to have 6 different layouts. 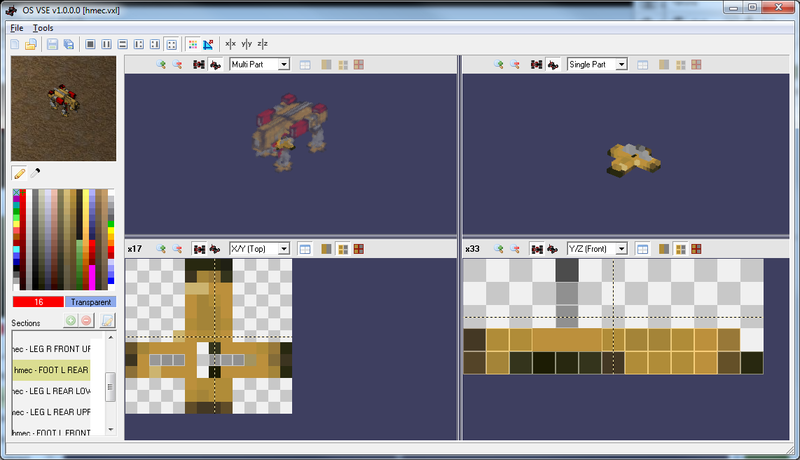 At the top left is a preview of the Voxel which is animated if the Voxel has animation. Attached is the WIP build. You can change the 2D Slice Position by holding CTRL and either clicking or moving the mouse on a 2D view. Using the Mouse Wheel while over a 2D or 3D View (With 2D You need to be over the actual grid) will zoom in/out. So i am wondering what peoples thoughts are. Certainly modders would want new features as well. There have been questions on resizing the voxel to other than just double the size that VXLSE is able to do like to size of say 1.5 or 0.6 etc. of the original size. Looks cool keep it up. You come for the modding but you stay for the Crap Forum. But where is the S of the OS? Would be sad to see you vanish for a while again and this going to waste. There have been questions on resizing the voxel to other than just double the size that VXLSE is able to do like to size of say 1.5 or 0.6 etc. of the original size. An issue would be that it wouldn't look correct. When you resize voxels you have a limited palette of colours, you can't use Anti-Aliasing to smooth the image so that it looks right even when resized with a different aspect ratio, your instead stuck with "Nearest Neighbour" (Photoshop) resizing which looks bad when its not resized by a value which is a multiple of the original size. Which member of the community is going to take up the torch then? Banshee wouldn't bother touching it as VXLSE III has way more features and he's familiar with VXLSE III (So he can add stuff easier). Banshee started VXLSE IV but abandoned it due to the fact it would take him too long to re-make VXLSE when he can just continue to add stuff to VXLSE III. Then there is.... no one else. SHP Toolz Source hasn't been used by anyone for example. Before i started OS VSE i released source code for loading/saving VXL files(Which "powers" OS VSE) which no one has used and Banshee made it clear he wouldn't touch it. There just isn't any history of people actually using source i release in an unfinished state. 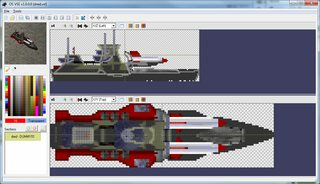 Even VXLSE III wasn't touched by anyone other than Banshee for years and years (Long after i stopped working on it). OS VSE isn't at a stage where there is anyone who would bother contributing as its lacking alot. The idea was to release the source code once v1.0 was released with the expectation that no one would bother using it. Just keep working on it absently, there's no rush or deadline, focus on the ui like we discussed and don't worry about completing it. I'd have abandoned my mod long ago if I thought there had to be goals and metrics to reach. 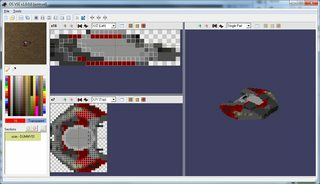 I love the layout, one of the main reasons I still use Will's Voxel Editor instead of VXLSE is because you can quickly & clearly see & edit all three axes at the same time. I worked on the Normalize. 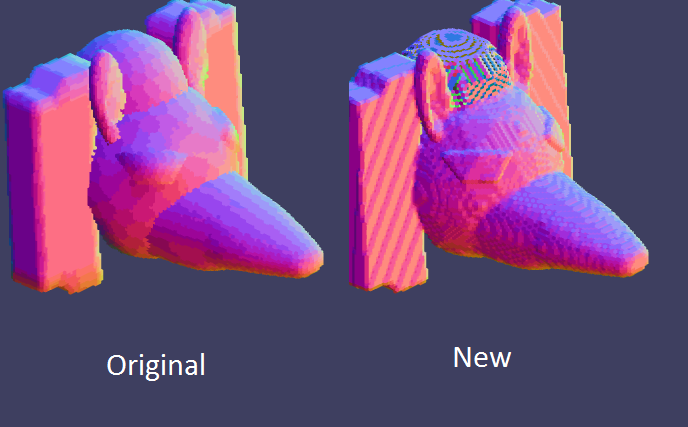 With the updated normalize if the Voxel has hollow insides but is sealed off, the normals should be correct (Unless its a very rounded surface). It basically reduces the chances of not being able to work out the direction of a surface. As the normalize feature may be useful to someone (May not) i have attached the updated build. Note: In the 2nd example the Hat is not actually sealed. So OS VSE can not determine the voxel directions and that is why the hat looks so wrong (As it falls back to using the voxel positions when it can't determine the direction). The Normalize works best with vehicle like VXL's (More boxy, hard edges, less rounded). 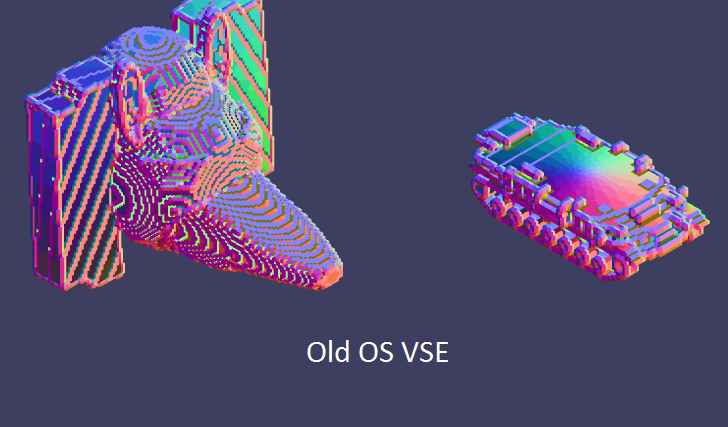 EDIT: I forgot to include a comparison with old OS VSE. 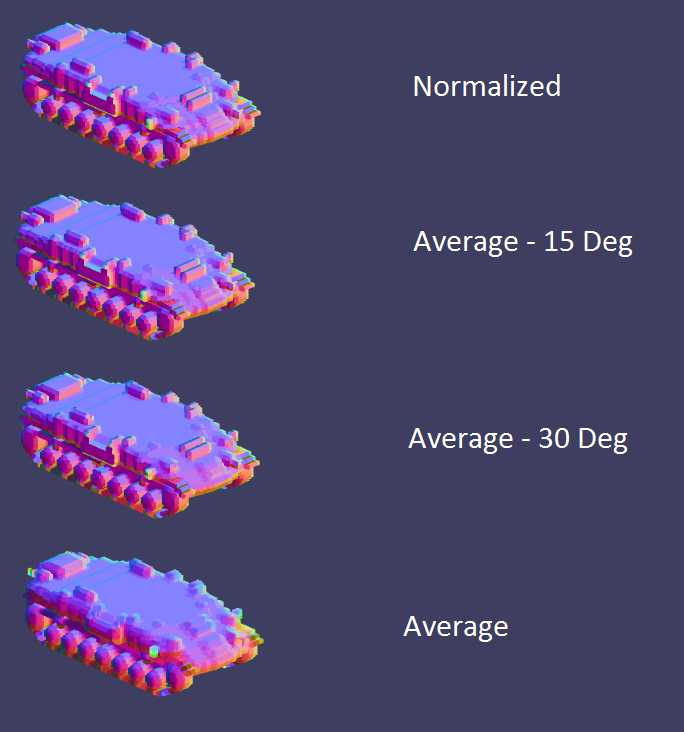 Can an alternate method to view normals be done? Like small lines coming out of every volumetric pixel (or just outer cells only) similar to a sea urchin. It would be easier to relate with a tangent line to a curved surface. That would be easy to view mistakes. I have looked into it but i can't find any OpenGL code that works. It just either does nothing visually different or screws up the view. yea i patched the 35.264 to 26.565 with my super haxoring skills, antialias makes it hard to tell if its pixel perfect but its on the eye accurate then. Updated the source code with your value. In re-guards to Double Precision thats the delphi compiler and i don't know if its possible to specify singles (you don't have the 1.0f like with C/C++) without making everything a constant (Which would just be annoying). Given that OS VSE is not a real-time renderer (Its not constantly re-rendering each frame) but instead only generates and stores a new frame when something changes there wont be any noticeable difference. Below is an image without AA which uses your value. might have some precision caused difference but if that can't be fixed then its close enough. Generally you never get the exact number(Even with doubles you generally get rounding). Even if you supply a high precision number, the conversion to single precision will alter it. OpenGL does have double precision variants of functions but its not really going to make a massive difference. You only really need double precision(Or higher) if your worlds scale is large, as in where you have objects that are say 50000 as well as ones with 0.0005 in size (Or position). Added Normal Smoothing Tool (Tools -> Smoothing). It uses the Average method with 3 different settings (Later it will likely have the ability to fully customize) which determine the maximum angle difference. Basically when smoothing if the angle difference between 2 voxel's normals are too large it won't include that voxel when smoothing. Thus it can be used to preserve hard edges while smoothing rounded edges. Attached is the WIP Build incase its useful. Note: Everything is only applied one time. Before Each Smoothing Normalize was used. My firewall just alerted me that OS VSE requested permission to access the internet. What is most surprising tho is that it wasn't even running at the time, I didn't launch it & I cant find it in task manager either. I honestly have no clue. Technically it should, but i have no way to test it (my 2004 pc which has XP no longer works). I can test stuff on Win7, Win8.1 and Win10(if i nick my dads Win10 laptop). One thing i forgot to mention is that OS VSE does the Left and Right views the opposite way to VXLSE III. 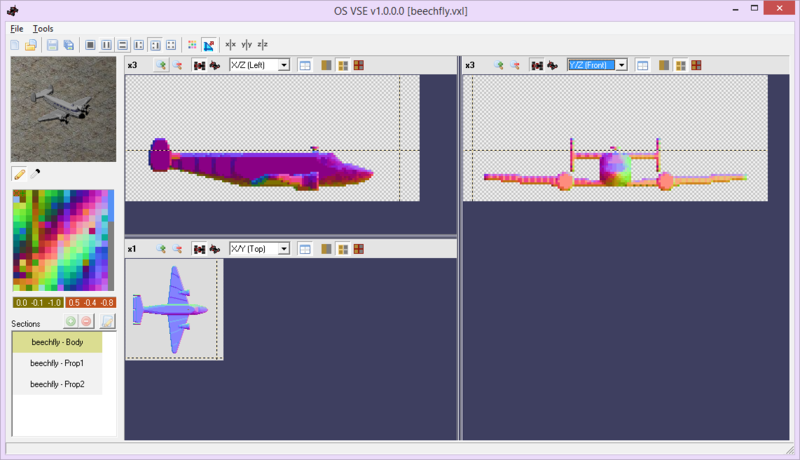 OS VSE considers Left and Right to be when your looking at the voxel from its front. VXLSE III considers Left and Right to be when your looking at the voxel from its back. Basically as the following image shows (click it to enlarge), when looking at the top view, the top part is right and the bottom is left. I am not sure if this will be confusing for people or not (It doesn't effect the viewports, its just the actual names for them). It can be confusing indeed, not just because it's opposite to VXLSE III. Sometimes when I shuffle between layers in the top/down view in VXLSE III, I get confused to which is left and right. I suggest adding two small, transparent letters "L" and "R" at the appropriate sides in the top/down and front/back views to avoid the confusion. Some views in VSE were (are still?) wrong anyway, so i think it's fine as long as all the views are consistent in their naming/view direction. don't have some views where it is "from" and others where the view direction is "towards". I haven't checked it yet, but i would like to see Z being the height axis, with X and Y the ground plane. VSE with Y being height is confusing as hell imo. Though for those who got used to this an option to switch Y and Z would be surely nice. Z is indeed the height axis in OS VSE. OS VSE uses the VXL format's axis rather than converting it. As you can see in the image below its using Z for height. It also tells you what the X and Y axis of the 2D view represent. Note that negative ones mean that the view is flipped with 0,0 being bottom right and not bottom left. I made sure each view looks correct from the perspective of that side(Hence why the right side is flipped). It does, although not without surprises. On my laptop it gives an error on launch (Access violation at address 00000000. Read of address 00000000), then freezes when try to browse any voxel in the "open" dialog. This doesn't happen on my second PC, that runs on XP as well (both are old). 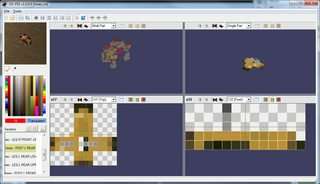 The former might happen because my resolution is 1024x600 or maybe because of laptop's GPU, the latter happens because the program tries to generate preview pics of each voxel in the folder, and the laptop doesn't like it at all. If possible, I'd add an option to disable voxel previews in the open file dialog. It does launch and work on the second PC, but performance is much slower compared to VXLSE (maybe because of the way 3d preview is handled, with all the cubes being rendered instead of the hollow shell approach VXLSE preview uses). My specs are 1GB RAM, 2GHz CPU and 256 mb video memory. Idk if you should consider optimizing it for garbage like this, but as it stands, VXLSE is the obvious choice for me at the moment because of this problem. As you will be expanding the features, please add alt+click to pick a color, like in VXLSE (that one neat feature borrowed from photoshop). Being able to copy the currently selected layer into clipboard (to edit it in image editor) or paste an image from clipboard into the layer like in VXLSE would be very useful as well. OS VSE uses PBuffers and likely requires at least OpenGL 2.1 . An access violation with an address which is all zeros would suggest that something its trying to use (Like PBuffers) doesn't exist.